Victoriana Magazine. Compiled and edited by Priscilla Haug. 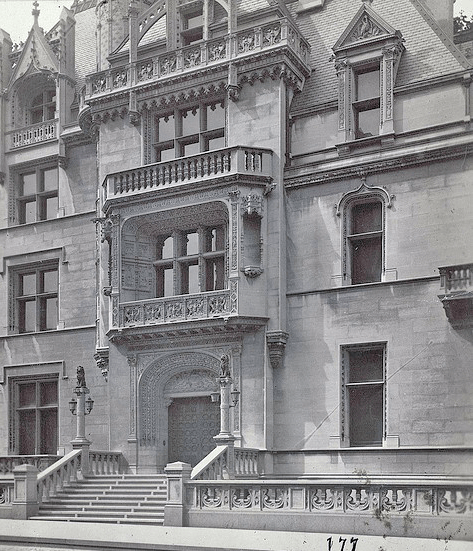 “Vanderbilt Ball – how a costume ball changed New York elite society.” Weblog of the Museum of the City of New York. Some costume descriptions from Fancy Dresses Described by Arden Holt. New York: Debenham & Freebody 1880. 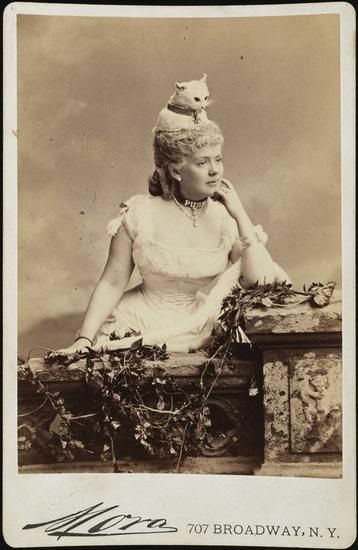 Invitations (about 1,200 were issued) were in great demand, even by such personages as Mrs. Astor. 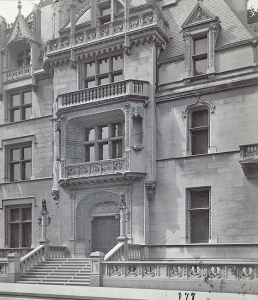 By 8 o’clock a large crowd had collected at Fifth Avenue and 52nd Street watching a group of workmen putting up the awning over the entrance of the Vanderbilt residence. … Early in the evening a squad of police officers arrived to keep the expected crowd of sightseers in order and to direct the movements of drivers and cabmen. People wandering around, watching the house and taking up positions on the steps of the houses opposite or standing on the adjacent corners waiting for the carriages to arrive. Carriages containing the more youthful and impatient of the maskers drove past the mansion before 10:30, the occupant peering surreptitiously under the curtain to see if others were arriving as he rolled by. The well-to-do but uninvited were also curious enough to drive by and peak at the house and the crowds around it. Kate Fearing, known as Puss, with her unfortunate cat. The costumes ranged from the ridiculous to the sublime. Guests entered the house through a white marble doorway and were escorted by a footman in livery down the grand hall (65 feet long, 16 feet in height, and 20 feet in width). The floor underfoot was of Echallion stone, and above a ceiling paneled in oak. Japanese lanterns were strung between stone columns. Greenery and floral arrangements were everywhere: potted palms, masses of ferns and ornamental grasses, waterfalls of roses. Over a high wainscoting of carved Caen stone were antique Italian tapestries. To the right a stairway occupied a space 30 feet square and climbed to a height of 50 feet. Later in the evening, a charge of the light brigade of hobby-horses would come dancing down the stairway. The company descended to the superb French drawing-room in the style of Louis Quinze4— where Mrs. Vanderbilt and Lady Mandeville5 sat to receive their guests. Alva Vanderbilt as a Venetian Princess taken from a picture by Cabanel. Mrs. Vanderbilt’s irreproachable taste was seen to perfection in her costume as a Venetian Princess taken from a picture by Cabanel. The underskirt was of white and yellow brocade, shading from the deepest orange to the lightest canary, only the high lights being white. The figures of flowers and leaves were outlined in gold, white, and iridescent beads: light-blue satin train embroidered magnificently in gold and lined with Roman red. Almost the entire length of the train was caught up at oe side, forming a large puff. The waist was of blue satin covered with gold embroidery the dress was cut square in the neck, and the flowing sleeves were of transparent gold tissue. She wore a Venetian cap, covered with magnificent jewels, the most noticeable of these being a superb peacock in many colored gems. Lady Mandeville wore a costume in most fortunate contrast with the toilet of Mrs. Vanderbilt. Her dress was copied from a picture by Vandyke of a Princess de Croy. The petticoat was of black satin embroidered in jet. The body and train were of black velvet, ornamented with heavy jet embroidery. The dress had large puffed Vandyke sleeves, an immense stand-up collar of Venetian lace, the sleeves being turned up with the same lace. The whole was crowned with a black Vandyke bat and drooping pinnies, turned up at one side and blazing with jewels. Nothing could have been more becoming to Lady Mandeville’s blonde beauty than this magnificent and somber dress. The host, Mr. W.K. Vanderbilt appeared as the “Duke de Guise,” wearing yellow silk tights, yellow and black trunks, a yellow doublet and a black velvet cloak, embroidered in gold, with the order of St. Michael suspended on a black ribbon and with a white wig, black velvet shoes and buckles. In the gymnasium on the third floor (an apartment 50 feet in length by 35 in width) the members of the six organized quadrilles of the evening gradually assembled before 11 o’clock. Lots were drawn Saturday last by the ladies in charge of those quadrilles to decide the order in which they should be danced. 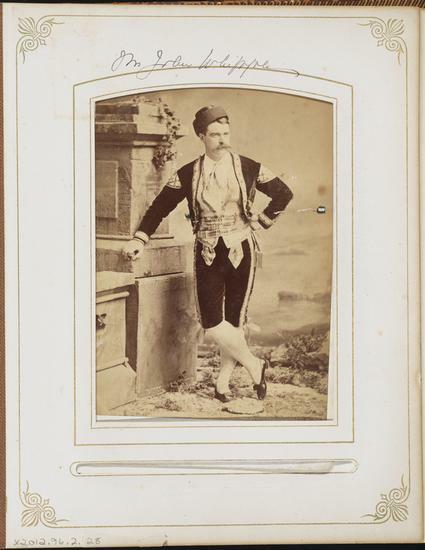 Julian Halstead Kean took part in the Mother Goose Quadrille. Soon the groups began to wander to the grand staircase to see the quadrilles come down. At a little after 11 o’clock, to the strains of Gilmore’s Band, the six quadrilles, comprising in all nearly a hundred ladies and gentlemen, were formed in order in the gymnasium and began to move in a glittering processional pageant down the grand stairway and through the hall. Winding through the crowd of princes, monks, cavaliers, highlanders, queens, kings, dairy-maids, bull-fighters, knights, brigands, and nobles, the procession passed down the grand stairway and through the ball into the room at the front of the house in the style of Francois Premier, wainscoted richly and heavily in carved French walnut and hung in dark red plush. Vast carved cabinets and an immense, deep fire-place give an air of antique grandeur to this room, from which the procession passed into a bright and charming salon of the style of Louis XV., 30 feet in width by 35 in length, wainscoted in oak and enriched with carved work and gilding. The whole wainscoting of this beautiful apartment was brought from a chateau in France. On the walls hang three French-Gobelin tapestries a century old, but in the brilliance and freshness of their coloring seemingly the work of yesterday, and over the chimney-piece hangs a superb portrait of Mrs. Vanderbilt by Madrazo, full of spirit, character, and grace. First the Hobby-horse Quadrille came down the great stair The horses were the most wonderful things of the kind ever constructed. The workmen were two months in finishing them. They were of life-size, covered with genuine hides; bad large, bright eyes and flowing manes and tails, but were light enough to be easily and comfortably attached to the waists of the wearers, whose feet were concealed by richly embroidered hangings. False legs were represented on the outside of the blankets, so the deception was quite perfect. The costumes were red hunting-coats, white satin rests, yellow satin knee-breeches, white satin stockings. The ladies wore red hunting-coats and white satin skirts, elegantly embroidered. All the dresses were in the style of Louis XIV. After these energetic riders had galloped off, the Mother Goose Quadrille entered. Then came the Opéra Bouffe Quadrille6, and the Dresden China Quadrille — all in purest white, in court dresses, with the little mark of the two crossed swords hanging on their breasts, these imitators of Dresden china made an effective sweep of white color in the midst of medley. After it came the Star Quadrille, was danced by young ladies, each adorned with a diamond star on the forehead, and with wandstipped with stars. Mr. Cornelius Vanderbilt appeared as Louis XVI. in a habit de cour and breeches of fawn-colored brocade, trimmed with silver point d’Espagne, a waistcoat of reseda, trimmed with real silver lace. The stockings, shoes, and hat were of reseda. He wore a jabot and ruffles of lace. Mrs. Cornelius Vanderbilt II came as Electric Light. Fire was illustrated by a curious gleaming red substance which flamed up the skirt and around the neck; it was an impressive dress; and the lady wore those now rare old-fashioned deep orange topazes.7 She was accompanied by her children, one costumed as a rose in pink tulle, with a satin overdress of green leaves, a waist of green satin and a head-dress of white satin, fashioned like a bouquet-holder: another as Sinbad the Sailor, in white satin breeches, a white chemisette, a flying jacket, embroidered in gold, and Turkish shoes, and a third as a little courtier, in a light-blue satin hand-embroidered coat, with waistcoat and breeches of white satin, and embroidered in roses and daisies. Miss Fish wore the beautiful pointed cap of Mary of Burgundy, and the long regal cloth of gold. Mrs. Paran Stevens in a red wig was magniﬁcent as Queen Elizabeth. Mrs. Pierre Lorillard wore a costume of Phoenix arising from its ashes. Mrs. Eliot F. Shepard was arrayed as a Venetian Lady in high pearl collar. Mr. Hurlburt, of the World, had an especially correct and beautiful costume as a Spanish Knight of Calatrava, a sort of religious the Knight Templar order, with long white cloak, with black satin hood, red cross on the arm, and a black velvet suit of seventeenth century, with collars and cuffs of old point de Venice. One of the most effective costumes was that of Richard M. Hunt, the architect of this beautiful house, as Cimabue.8 It was a happy thought, for the early Florentine dress of white and gold, the hood and short cape, was one of the most distinctive dresses present. 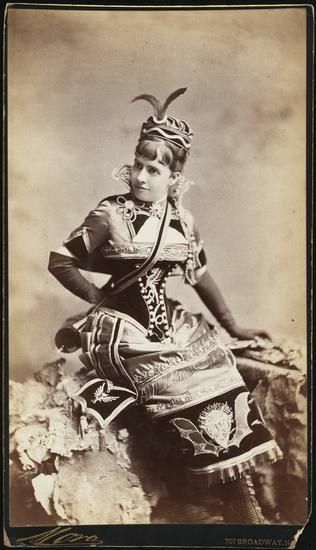 Miss Elizabeth Pelham Bend (later Mrs. Henry Asher Robbins) costumed as Vivandiere du Diable, via Larry Tenney at Pinterest. The stage, of course, afforded the ideas for the greatest number of ﬁne dresses. Mr. Hewitt, our well-known Congressman, went as King Lear, with his mind, and with his three daughters. Mr. and Mrs. Laurence Turnure were splendid as Huguenots. 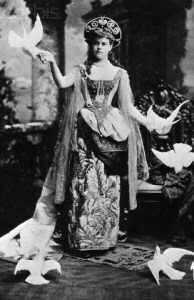 Miss Townsend, as the Fairy Queen in Iolanthe, wore a very handsome dress, white embroidered in gold. Madame Nilsson came as Marie Stuart. The opéra bouffe,9, plural: opéras bouffes) is a genre of late 19th-century French operetta, closely associated with Jacques Offenbach, who produced many of them at the Théâtre des Bouffes-Parisiens that gave its name to the form. Opéras bouffes are known for elements of comedy, satire, parody and farce. The most famous examples are La belle Hélène, Barbe-bleue (Bluebeard), La vie parisienne, La Périchole and La Grande-Duchesse de Gérolstein.] sent many representatives. The Comic de Brie, Charles Surface in the School for Scandal, Romeo, the Huguenot Count de Mole, Marguerite in Faust, and Harlequin all had their copyists. Historical characters like Sir Walter Raleigh, Don Carlos, Christopher Columbus, and Charleses I, II, and IX all were in order. 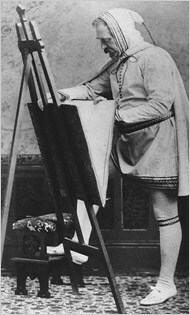 Henri Deux is the most picturesque of kings to copy. There were some very fine knights in armor. 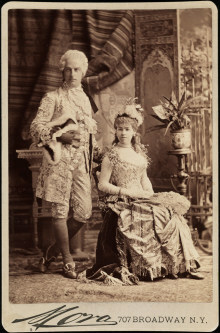 Miss Ada Smith, a sister of Mrs. Vanderbilt, wore, as a peacock, a dazzling costume of peacock-blue satin, the waist composed of real peacock’s breast, with a peacock cap and fan. The train and the front of the dress were covered with the peacock’s breast, with a peacock cap and fan. The train and the front of the dress were covered with the peacock feathers. 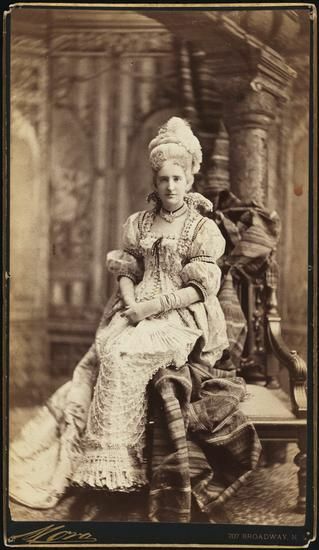 Mrs. Seward Webb, Mr. Vanderbilt’s sister, wore, as a hornet, a brilliant waist of yellow satin, with a brown velvet skirt and brown gauze wings. This dress was paralleled by another representing a wasp, of purple and black gold gauze, with horizontal stripes of black and yellow, and a transparent gold tissue overdress. A special head-dress was imported for this costume, with antennas of diamonds. Yellow gloves striped with black were worn with it. Miss Terry, as Summer, wore light blue and white satin trimmed with sheaves of wheat and with a jeweled scythe and corn flowers in her hair. Miss Work, as Joan of Arc, attracted great attention. She wore a white china crape, embroidered in silver fleur de lees, with a culrass, helmet, and gauntlets of solid silver mail, the bodice, leggings, and shoes being of steel cloth and the spurs of steel. Mrs. G.G. Haven wore a very handsome dress of terra cotta brocade and white satin, as a Princess, the daughter of Henri Deux. Mr. Fred Nelson appeared as Henri Deux himself in a dress of black velvet embroidered with gold. Mr. Thomas Maitland made an effective Capuchin monk of the barefooted order, with hood and sandals. Miss Hunt as a Court lady of the time of Francis II. wore a velvet dress of a singular shade of brown trimmed with Jewels. Mr. Hamilton Fish Webster came as a Spanish muleteer, in a brown velvet jacket and breeches, with a blue satin vest covered with buttons. Mrs. George L. Rives, as La Perichole, wore a short dress with an overdress made of a Roman sash, the dress being trimmed with gold fringes, and on her arms bangles with sequins. Miss Bessie Webb appeared as Mme. Le Diable in a red satin dress with a black velvet demon embroidered on it and the entire dress trimmed with “demon fringe”-that is to say, with a fringe ornamented with the heads and horns of little demons. Mr. Brockholst Cutting, as Blue Beard, wore a dress of blue and silver cloth, with blue silk tights and a gray felt hat with blue and gray plumes. The young Duke de Morny wore a Court dress of Louis XV with plum velvet embroidered with steel and rubies, and lined with the color called “crushed strawberry.” The buttons were made of real diamonds, rubies, and sapphires, and the chapeau was of velvet trimmed with feathers. Mr. Herbert Wadsworth appeared as Don Juan, in white satin, slashed and puffed with black velvet and embroidered with gold and silver. Mr. Henry Clews appeared as Louis XV., in chocolate and gray satin, while Mrs. Clews personated Fire, in a gorgeons costume of iridescent bronze, over flaming yellow satin. Mr. Wright Sanford wore a Court dress of the time of Louis XV., of gray satin: Mr. J. Sanford a Court dress of Louis XV., of blue satin. 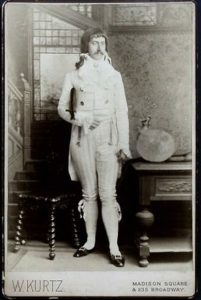 Mr. Abram S. Hewitt appeared as King Lear while yet in his right mind, and the costumes of his three daughters attracted much attention. Miss Sallie Hewitt’s dress as a Persian Princess was superbly embroidered by hand, and that too by a New York woman, Mrs. Wheeler, whose handicraft deserves commendation. According to Godey’s Magazine and in the currency of 1883, the estimated cost of entertainment for the ball was $50,000 — equal to the salary of the President; champagne alone cost $2,000. The house and contents were valued at $5 million.